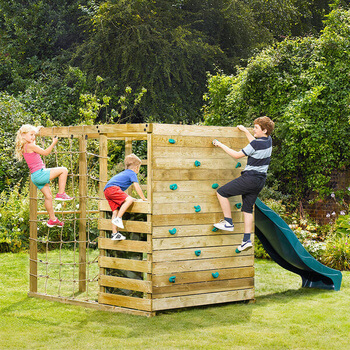 The Plum Climbing Cube is a great wooden play centre packed with great features! There are multiple ways to reach the main platform, including a rock climbing wall, a wooden ladder, and a climbing net. 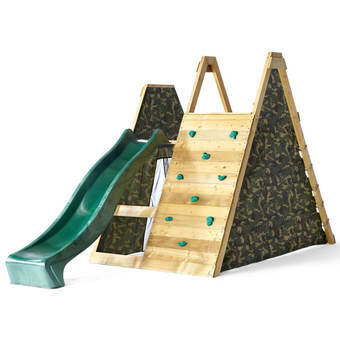 Once you're up there, you can get back down easily via the wavy slide! Hidden away at the bottom of the cube is a secret den, hidden by a camouflage fabric sheet with a roll-down door to get inside! 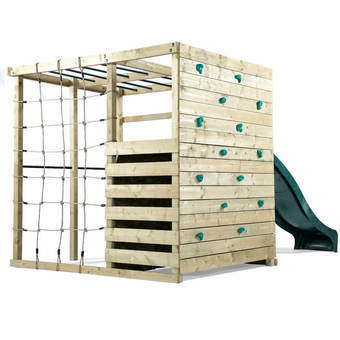 Structure contains a platform which can be reached via wooden ladder, climbing net, or rock wall. 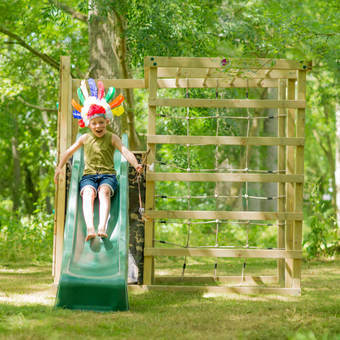 Wave slide converts to a water slide for even more fun just attach a hosepipe! Play den beneath the structure which is covered by a camouflage fabric sheet, and roll-down door. Purchased the Plum Climbing Cube Wooden Play Centre. The climbing frame was well packed. The packaging was weather proof and the wood was tied together very well. All the wood was numbered and predrilled which made construction fairly straightforward. There were only a few bits that needed to be drilled. An electric screwdriver is a must for building the climbing frame otherwise construction would have taken significantly longer and been a lot more difficult. The climbing frame feels sturdy without the need for anchors. Our kids are aged 2 and 5. Our twin 5 year olds mastered the rock climbing wall very quickly and even the 2 year old has managed to use the ladder and slid on his own. Very happy with the purchase, the seller and delivery. Like the fact it has a large climbing wall - my husband does this for real and the kids are always keen to join him but too dangerous to be let loose. This keeps them in the garden under our watchful eyes and they keep going back to it. Our two are 7 and 5, and I think they will get a good few more years out of it. This is great army-esque &#x28;is that a word&#x29; play frame that the kids love. I have two boys and their friends come over – I can leave them in the garden all afternoon whilst I get on with other jobs, and they role-play to their hearts content. 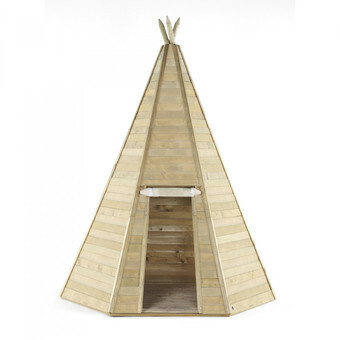 Seems quite pricey for what it is – but then the kids don’t understand this and they ultimately judge. Thank you to this company – price was on par with the best out there but had that personal touch you rarely find these days. Overall a great product for the kids. They love it and pretty much had the whole street come in and play on it in the last few days. A couple of points to watch out for though is it does need two people to put it together and it does take around 5-6hrs if not more to put it together. They were a couple of components missing, just a couple of bolts and nuts which you buy get in your local hardware shop but it was quite frustrating to spend so long on it and then find you didnt have everything to complete the job. You also need to pay really close attention to not only using the right piece of wood in each step of the build but also to get the orientation of that piece right. As nearly all the bits are square or rectangle if you get one the wrong way round you wont know to far later in the build which can cost you to back track, which i learnt to my cost, took me about an hour to put right. Once complete though its totally worth the money and it many different challenges for my young ones. The added extra of the den underneath is a winner to. It would have been 5 stars if all the pieces where present. One piece was missing as we constructed it yesterday. I have had to improvise to make sure the kids can play. I would like the piece sending to me? D1963. Quick delivery. Sturdy frame and looks good in the garden. The kids love it. I had to get somebody to assemble it. It took about 5 hours and needed 2 persons. 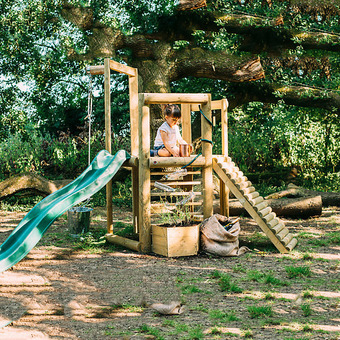 This climbing frame is brilliant - good for kids of all ages and abilities. Excellent customer service and very helpful. BOUGHT THIS FOR MY GRANDAUGHTERS 5 BIRTHDAY, NEADS 2 PEOPLE TO PUT UP. ABOUT 5-6 HOURS VERY GOOD AND WELL MADE. GOOD CUS/CARE SERVICE AND DELIVERY AS I LIVE ON THE IOW. Q: Hi - Dies the frame come with all of the fixings needed to build? A: Everything you need to build the frame comes included in the product. A: Plum advises that this frame takes around 6 hours for 2 adults. A: The platform is 120cm from the floor. Q: Do you need to anchor the frame into the ground with special fixings or use cement? A: Plum recommends cementing all of their products to ensure stability. 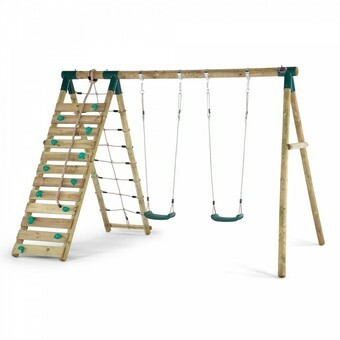 Q: How many protektamats do you recommend using with this climbing frame? A: The 2 will enough for the slide area. However it depends on where you want to use them. Q: I want toplace an order for a Christmas present for my kids however want to ensure if I order now (as I want to ensure availability) that I will still be covered if any piece are missing or anything if we are not building it and therefore checking everything until near Xmas Day? A: We would always advise checking the product well in advance of Christmas, as our office will be closed until the new year. This will allow us to help out in the unlikely event of missing parts, and avoid any disappointed kids on Christmas day. Q: What is the overall length of the vertical posts? How much is to be set in concrete? 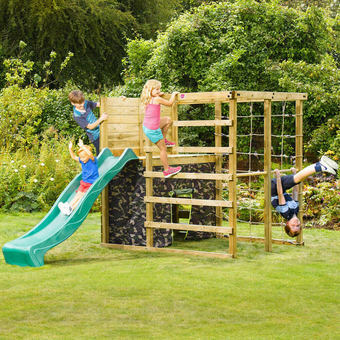 A: https://www.plumplay.co.uk/media/assembly-instruction-manuals/27547_Climbing_Cube_Wooden_Climbing_Frame.pdf Please see a link to the manual. However it is not the leg that will con in concrete it will be part of the anchor which will be attached to the leg. 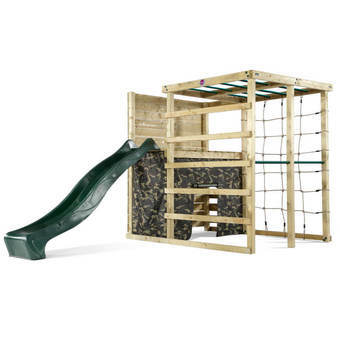 Q: We’re looking for a replacement camouflage den, is it possible to just purchase that item? Need to know something about the Plum Climbing Cube? Leave your details and your question below and we'll email you the answer soon, as well as publishing the answer for future customers in the Questions section!